An Aperitif for National Absinthe Day! Happy National Absinthe Day! Here at Geeks Who Eat Headquarters we couldn’t possibly let this day go by without our resident mixologist, Matthew creating a drink for you! However, before we get to the recipe, how about a little history about absinthe and some fun facts we found (we are geeks after all)? It is commonly referred to in historical literature as “la fée verte” (the green fairy). Absinthe’s popularity grew steadily through the 1840s, when absinthe was given to French troops as a malaria preventive. In the 1990s, realizing the UK had never formally banned absinthe, British importer BBH Spirits began to import Hill’s Absinth from the Czech Republic, which sparked a modern resurgence in absinthe’s popularity. 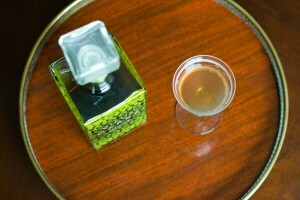 We recently started playing around with absinthe here at the GWE Headquarters and find it to be very interesting. Between its creamy yet licorice like flavor and the fact that it changes colors when you add it a little water, we love trying to find new ways to use it! 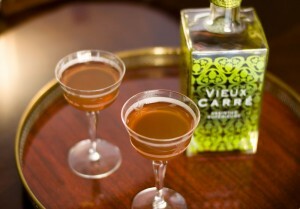 Below is Matthew’s National Absinthe Day Aperitif recipe! We hope you enjoy it! Fill mixing glass (a pint glass will work in a pinch) with ice. Combine all ingredients except absinthe in a mixing glass and stir. Strain into an aperitif glass.